Following AFR100’s launch at COP21 this winter, efforts are underway to harness the potential of this cross-sector partnership and translate its diverse funding structure and technical-assistance platform into restoration success on the ground. 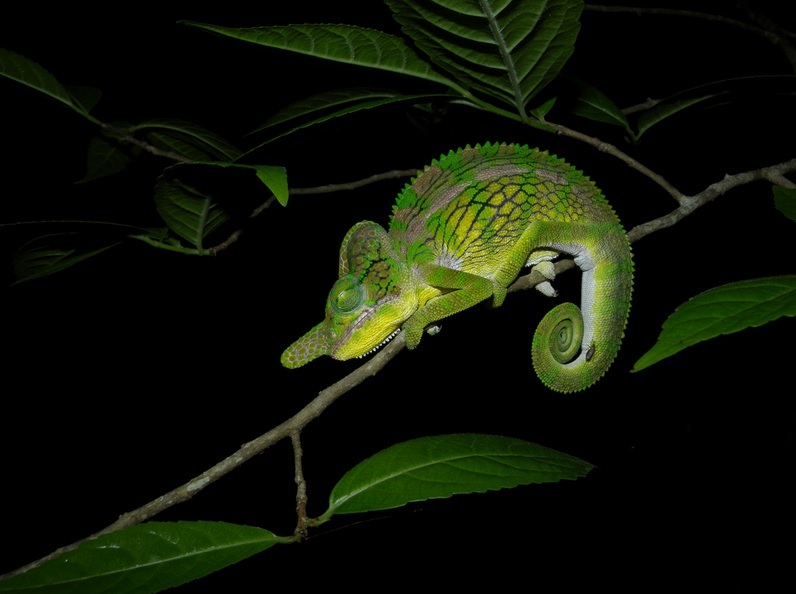 This photo by Frank Vassen depicts a chameleon in Madagascar. Facing trends of forest loss on the order of millions of hectares each year, topsoil loss threatening agricultural productivity, and accelerating population growth trends, African leaders and their AFR100 partners identified restoration as an opportunity to support aligned environmental and development goals through projects. These efforts will include agroforestry, silvopastoral systems that combine forestry and livestock grazing, plantation forestry, and reforestation. Inspired by the Bonn Challenge and catalyzed through conversations at the 2015 World Forestry Congress and an African Union forum on landscapes, African leaders sought to set and achieve an ambitious restoration goal for the continent. With support from the African Union’s New Partnership for Africa's Development (NEPAD) technical body, World Resources Institute (WRI), and the German Federal Ministry for Economic Cooperation and Development (BMZ), the AFR100 initiative was announced at COP21. Funding for AFR100 projects comes from a variety of sources. The World Bank has earmarked $1 billion for the effort as part of the Africa Climate Business Plan. BMZ continues to provide support for initiative infrastructure. Additionally, $545 million has been committed by impact investors and social entrepreneurs interested in the effort. These investments and partnerships have not been combined into an overarching fund given their varying social and environmental safeguards and requirements, but contributions can be more easily accessed and coordinated by potential restoration project leaders through the AFR100 platform. AFR100 partners hope that over time they can develop a pipeline of bankable restoration projects and provide the enabling conditions to efficiently connect potential projects with interested investors. Camille Rebelo, co-founder of EcoPlanet Bamboo, one of AFR100’s project partners, said that the company’s restoration work through bamboo cultivation on degraded lands is ongoing on former agricultural areas in South Africa and deforested areas in Ghana, with plans to scale up to as much as 40,000 hectares within the two countries in the next five years. AFR100 is supported not only by creative financing, but also technical infrastructure and other enabling resources to advance restoration in Africa. NEPAD is responsible for political mobilization engaging African governments. BMZ is coordinating with potential additional bilateral donors. Current technical assistance work led by WRI is underway to develop briefs identifying the specific challenges, restoration priorities, investor interests, and technical assistance needs in each participating country. Through these analyses, AFR100 technical assistance partners, such as The Nature Conservancy (TNC), International Union for Conservation of Nature (IUCN), and WRI hope to better align future support with country needs and more efficiently connect financers with bankable projects. As other regions, including Asia-Pacific and the Mediterranean, consider similar conservation finance platforms, AFR100 has the potential to provide a model and lessons learned for funding and achieving restoration goals at significant scale.